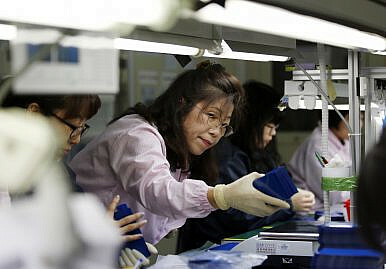 Kim Yeon-soon, 55, who leads a quality control team for Puretech Co, checks the final products at a factory in Ansan (March 2, 2015). Women’s participation in the labor force in South Korea has been climbing: except for an abrupt drop in 1998—a result of the 1997 Asian Financial Crisis, when the female labor participation rate dropped nearly 3 percent from the year prior—women’s share of the total labor force has climbed from 39.3 percent of the total working population in 1992 to 41.6 percent of the total working population in 2014, according to the World Bank and International Labor Organization. The Korea Statistical Information Service (KOSIS) figures from July 2016 reported last month that 52.7 percent of working-aged Korean women (aged 15 and older) participate in the workforce, compared to 74.7 percent of men. For a country that is facing demographic decline—a shrinking population due to both aging and a declining birthrate—the absence of nearly 50 percent of women from the workforce means the economy will very soon face a severe shortage in workers who could play a vital role in sustaining and growing the economy. The South Korean government has sought to address this by promoting immigration in certain sectors of the economy on the one hand while also thinking about supporting women in the workforce. To do so, creative thinking and major social and workplace cultural restructuring will need to take place. The issue is not only that women are not able to get jobs; many are not seeking employment in the same way as men. The unemployment rate for men seeking employment is 3.8 percent, and for women it is 3.2 percent. Women get a head start in the work force, by some measure, as a two-year military service for young men means their working life is delayed. But by other measures, military service has historically provided men with other less quantifiable advantages, such as networks of military superiors or social capital from having served in certain branches. In fact, the gender discrepancies during the late 20s and early 30s is so pronounced and so meaningful that South Korea’s Ministry of Gender Equality and Family has of late targeted helping women in those age cohorts. Even more than workforce participation, it is the trajectory of women’s careers that reveals gender gaps. Since 2009 women have surpassed men in terms of university entrance—a 7-percentage point gap as of 2013—but despite some increases still struggle to gain entrance in a number of elite fields. Korean women comprise 19.4 percent of lawyers, 23.9 percent of doctors, and 23 percent of university professors. The discrepancy is even more pronounced in terms of leadership positions. The Wall Street Journal reports that of the 1,787 companies listed on South Korea’s stock exchange, only 13 are headed by female CEOs (and four of those women are directly related to the companies’ founding families). Women occupy only 8.8 percent of senior civil service positions, which is notable because in 2015, 46 percent of those who passed the civil service exam were women. Korean media heralded the jump for its quadruple increase over the share in 2001, but time will tell whether the younger generation of women will be able to break through the glass ceiling. The World Economic Forum placed South Korea at 115 out of 145 countries ranked in terms of economic participation and opportunity, largely a result of the wide pay gap and the small number of female legislators, senior officials, and managers. South Korea has one of the largest pay gaps between women and men’s remuneration for work in the OECD. On average, women make 36.6 percent less than men in South Korea. Women have been supporting the South Korean economy for virtually all of its modern history, often in less visible roles. Whether in the form of light-industrial factory work during the developmental era led by export-oriented endeavors or as unpaid household labor, women have provided unquantifiable contributions to the economic well-being of South Korean families and the country’s economy as a whole. The iconic M-shaped employment curve of women’s workforce participation has become a legend in South Korea. The “M” refers to the pattern of employment over the course of a women’s life: the percentage of women employed rises significantly for women in their 20s but, due to marriage and/or childbirth, declines as women fall out of the workforce in their 30s and then rises again as women gradually rejoin the workforce throughout their 40s. This differs from a “U-shaped” workforce participation, where the percentage employed rises sharply during the 20s and then doesn’t decline again until their 60s, as is the case for men in South Korea. For managers who are more conservative (or practical, depending on the point of view) the M-shaped curve means that potential female employees will likely leave their post shortly after marriage and certainly after childbirth, making promoting or even hiring women an unreliable bet. For critics of hiring and promotion practices, the curve represents socially pervasive stereotypes and structural barriers to women’s competitiveness in the Korean workforce. As a result, many of the women who re-enter the workforce during or after raising a child participate in non-regular employment: short-term contracts and part-time work. An IMF report from March 2015 found that the gender wage gap in Korea is associated with non-regular employment. Nordic countries such as Denmark, Norway, and Sweden are often upheld as exemplars of boosting female workforce participation for Korea (and for Japan, which faces a similar pattern; Prime Minister Shinzo Abe even made supporting women in the workforce part of his third arrow of economic restructuring for the country, but his “womenomics” is making slow progress.) Policy interventions such as affordable childcare services and paternal involvement in childcare are recommended as help for would-be working mothers. A 2015 IMF report also found that regular employment for women is also associated with higher fertility, which suggests that support for childcare and more avenues for full regular employment for women may aid the Korean economy now and in the future. Scholarly research has demonstrated that government policies alone do not account for variations in female participation and equal compensation: Taiwan, an “Asian tiger economy” like South Korea, has similar policies and low expenditure on welfare programs, and yet women are much more present in the workforce, including managerial positions. This indicates that there is a difference between statistics and lived experience. The social barriers and brutal work culture in South Korea mean that many women choose not to or cannot find space in the Korean economy today. Large restructuring of social and workplace culture will be necessary. Childcare will not only need to be affordable and widely available, but also less stigmatized. Paternity leave may be introduced, but it will not be successful until household and childrearing duties are shared more equally among parents (or other adult family members). At the individual level, these changes will free up women in Korea to choose their contributions to Korean society and the nation’s economy. And such changes would not only to provide pathways for more women to realize their potential contributions to the Korean economy, but also for the Korean economy to reach its highest potential. Darcie Draudt is a PhD student in Political Science at the Johns Hopkins University, a non-resident James A. Kelly Korean Studies fellow at Pacific Forum CSIS, and director of research at Sino-NK. South Korea's emerging chess scene is dominated by its young players. Can they break through on the world stage?